My clients are frustrated with [unexpected and frequently destructive Win10 patches] and I don’t have a good answer other than one I have chosen myself. I moved my personal computers, except for one laptop back to Windows 8.1 as it seems to be clear of the update mess and it has update support for about 4 years. Do you recommend this as a solution to individuals who don’t care to know that Microsoft screwed up, they just don’t want their Windows 10 computer to have to be repaired again via a clean install of Windows and then manually reinstall all applications and user data? I don’t know anyway to protect them from unrequested updates that may then cause their machine to not boot. Telling them to backup is beyond the skill of most average computer users and even if so, how would you know when to do a backup as the updates happen in the background without warning. Windows 8.1 remains the most stable version of Windows — even more stable, of late, than Win7, and considerably more stable than any Win10 version. It has the fewest patches, the fewest bugs. You can block updates until you’re ready to install them (hopefully with an eye to the AskWoody MS-DEFCON setting). General usability ain’t much, but if you install a Start menu replacement like Start10 or Classic Shell (now open source), it’s fine. I’d say get ’em on Win 8.1, and gradually move them over to Chromebooks. Any dissenting opinions? MrJimPhelps 5 months, 1 week ago. 14 users thanked author for this post. If the computer originally came with Win8 or 8.1, I say go for it. I have moved my main Windows computing to Win8.1, using Classic Shell -> now Open Shell and it’s a rock. Never mess with the stupid mobile menu/desktop. HOWEVER. I would bet a LEGAL copy of Win8 or Win8.1 is hard to come by these days. Lots of illegal stuff out there (even with vendors like Amazon selling bad s/w). I would be doubly careful before removing a good copy of Win10 – Backup, Backup, Backup!! Images and data. 12 users thanked author for this post. Obtaining a legitimate license for W8/ 8.1 IS the hurdle here. Many have bought them as a failsafe, myself included (now on 2 ex-W7 devices) I’d agree, W8.1 is rock solid and a good choice IF you can get it. @ep probably the best way is to get a refurbed Win10 Machine that had Win8.1 on it and just download the Win8.1 .iso off M$: https://www.microsoft.com/en-ca/software-download/windows8ISO and install as either a clean install or dual boot with Win10. Yeah you’ve guessed how to determine the previous pedigree of the old refurbed Machine is the obvious drawback to that plan? Pulling the key out of the Bios is easily done with: https://neosmart.net/OemKey/ Question is as well if the Machine comes with Win10 Pro will you get Win7 Pro and above or Win8.1 Pro with the key. Needless to say every other scenario will give you Win8.1 Core/Home as they call it. There’s plenty around that used to run Win8.1 and they are of a decent age to make it a worthwhile gamble if you wish to speculate, why not ask the store if they know, probably wont be much good in a “Big Box” retailer outlet they barely know what theyre selling just so long as they get it out of the door. The 2 set in front of me right now of 2015 vintage HP 15-ac018ca and Acer ES1-511 fit that bill. Hey a bit of research and you never know your luck. Have to agree with PKCano’s comments in post-230862 regarding moving back to Win8.1 on machines that came with OEM installs (as opposed to finding new licenses). There may be another option though. Machines that came with OEM installs of Win10-Pro can often be downgraded to either Win7-Pro or Win8.1-Pro simply by installing the older OS and then activating by telephone. Just tell the phone rep that you’re exercising downgrade rights from Windows 10 Professional OEM. I believe this sort of downgrade may be OEM dependent, and machines with newer processors may not get updates for the older OS, so do a little research before plunging in. I downgraded a Lenovo laptop from Win10-Pro to Win7-Pro and if that machine (and me!) are still alive and kicking when Win7 falls totally out of support, I’m going to try it again with Win8.1-Pro. This would be an excellent way to purchase a new machine with Windows 8.1 installed. The only concern I would have is, can you get all of the needed Windows 8.1 drivers? Good point, another bit of homework to do before parting with any money. Lenovo seems to provide excellent driver support for the Thinkpad models that I own (and love). Other vendors may differ. Luckily I have all the original ISO’s and/or installation media, just in case the Windows 10 – Titanic starts spinning out of control completely. I am also on win 7, but there is only one year for extended support. Win 10 is no choice ( because each 6 months automatic windows reinstallation = broken system). I have no time solve stupid errors caused by Windows upgrade to new build 2x per year or even worse doing each time clean installation. I am thinking about Chromebox, maybe one reliable choice after Win 7 death. Chromebook is a very viable choice, and it’ll get better as we approach Win7’s demise in January 2020. I’ve switched almost all of my production work to G Suite and Dropbox. I hope we can pull in multiple people to talk about their experiences with Chromebooks, and moving from Windows to ChromeOS, as we get close to Win7 end of life. I concur — if the user prefers 7 to 10, and if he can get a legal copy of Windows 8.1 (or 8, then take the free upgrade to 8.1), Windows 8.1 is definitely the way to go. You can find lots of refurb computers out there with Windows 8.1 installed; some are really decent computers. If you go with a refurb, make sure that you have a good warranty. Get it from someone who has a store in your area, such as Walmart. In this way, you can easily return it for a refund if there is a problem with it. (Make sure that the vendor listed is “Walmart”; Walmart sells products from other vendors on their website, and they won’t honor a warranty from those other vendors.) Don’t depend on the warranty you can purchase from someone like Tiger Direct – it is worthless. * Windows 8.1 will be supported till Jan 2023, whereas Windows 7 will be supported only till Jan 2020. * Windows 8.1 is literally your last chance to continue with the “old” Microsoft way of doing things. There’s one thing I’d suggest in addition to Classic Shell to make 8.1 look like 7, and that’s Old New Explorer. It has a bunch of options, the most important of which is the one to remove the ribbon in File Explorer and bring back the classic menu bar (File, Edit, View…). If you use the default UI in either 7 or 8, which does not use the menu bar, it looks the same, but if you used 7 with the menubar enabled, you’ll see in 8.1 that it gives you the ribbon instead, not the menubar. Of course, there are custom themes, too. I was shocked when Greynad told me that some people he had shown Linux with Xfce to immediately rejected it as looking too old, even though what they were seeing was just a theme that can be changed in a matter of seconds. Maybe it’s just a function of experience, I thought… they just don’t know it can be changed, because they haven’t seen that they can yet, perhaps. Well, the other day, I saw a message from an experienced computer person, Linux user, and software developer, excoriating KDE for having a terrible flat UI. KDE is the most configurable desktop environment there is, and you can remove the flatness in seconds– the default installation of KDE usually includes three distinct widget themes that are simulated 3d and skeuomorphic. So, because of that, I want to emphasize that the look of 8.1 (excluding UWP) is just a theme, and you can change it. Same is true for 10. You will have to download a program to bypass Microsoft’s prohibition on third party themes (UXStyles, I think it is called, fixes it without modifying system files), and once that’s done, just grab one of the hundreds of themes out there. DeviantArt is (perhaps oddly) one of the best places to find them for Windows. Windows 8.1, Pro/MCE in my case and tuned up a bit (I also use Classic Shell), can be a very, very good desktop-only operating system. The OS having been installed once, 5 years ago, the uptime on my big, powerful, heavily used engineering development workstation says it all. It just runs and runs, doing everything I need during the day and stuff like system builds and backups that are scheduled to run at all hours of the night. And I’ve been able make it private and quite efficient. I don’t plan to swap this OS out for Windows 10, even though v1803 can do everything I want (as tested in a virtual machine on this workstation). I am hearing no demand from my software product customers for “Apps”. Extended support for Windows 8.1 ends January 10, 2023 so per Microsoft’s promise, if updates light your fire you won’t be left out in the cold until something like 4 or 5 more Windows 10 versions fall out of support. Not that there are many security problems with Windows 8.1 now. I can only write “Didn’t I tell you?” :). I never bothered with installing Classic Shell – most used shortcuts I have on desktop or taskbar, those rarely used I simply find by using Search. You really don’t have to visit Start Menu anymore. I only switched to 1803, because it’s fairly decent and gives me better framerates in games. Other than that – if you prefer simplicity and stability – W8.1 is the best choice. I’ve agreed with this for a while now, though not as long as some others here (Noel’s endorsement was a big part of why I got on board with 8.1). Still, that has to be kind of painful to write, Woody, given how you referred to Windows 8.1 in your book (Win 10 AIO) and in the forum description here! I didn’t get on board with 7 until after 8.1 was out– I happily used XP until then, and I would have gone right to the end of the POSReady support period if not for my desire to go with 64 bits, which didn’t ever catch on with XP. When I saw how bad 8.1 was, I chose 7 instead, and I thought 8.x had to be the worst Windows by design ever (as opposed to Vista, which was bad because of bugs). It was so bad that MS gave up on trying to rescue its name (Threshold was initially going to be 8.2, including a Win7 style start menu!) and gave us 10 instead. I guess I stand corrected. Win 8.1, after watching 10 for a while, looked so benign. Friendly, even. It had/has a weird UI that doesn’t belong on a PC, but it still knew that the user was the boss. It didn’t force updates, change your settings, uninstall your stuff, switch out your drivers without your consent, or update twice a year with huge, time-consuming updates that installed whenever they felt like installing. No “seekers,” no deferrals, no active hours, no metered connections– none of that stuff is necessary if you have an OFF switch. What was it I hated about 8.1 again? That tiled Start screen? I don’t find it any worse than the Win 10 one that takes up part of the screen. I know some new users got confused and thought their desktop programs were “gone” when the start menu came up, but it only takes a second to get past that. Simply setting the wallpaper behind the start screen to the same as the desktop helps a lot– it gives newbies a cue that the desktop is still there behind the start screen. What else is there that’s bad about 8? The Charms? Ok, I’ll give you that, but they’re blocked easily enough, with Classic Shell and/or Metro Killer. The apps? It’s just like Windows 10 (meaning “avoid them as much as possible”), and I think the default Metro styling is less ugly than UWP. The File Explorer’s ribbon? Same either way. The Settings app? You can avoid it and just use the good old Control Panel in 8.1, but not in 10… in 10, much of the functionality of Control Panel has been gutted, and it gets worse with each new version. It’s true that I wouldn’t have tolerated a lot of the issues with 8.1, but I was using Classic Shell and other similar things in 7 anyway, so if that was the case, why not keep using them but swap in 8.1? Of course, I’d put an asterisk next to the “and then Chromebooks” bit. For some users, it’s the least bad option, but that’s not exactly an enthusiastic endorsement. I’d suggest staying WELL clear of anything Google, generally. I see them as one of the most sinister entities across the tech sector, and I’d be hard pressed to feed the beast’s appetite for my data if there are other choices. I am not a fan of Apple either, as I find a lot of their business practices extremely shady, but I’d give them the nod before Google without having to think twice about it. If the person has a technical background even a little bit, I’d very much suggest going with Linux. Only if those don’t work and/or the person doesn’t mind being caught in the Google web would I suggest Chromebooks. I have, in fact, done just that when I thought it was the most fitting option for the user, but it’s not my go-to. (Noel’s endorsement was a big part of why I got on board with 8.1). After running Windows 7 (a great OS) for 5+ years on a Sandy Bridge PC, been running 8.1 now for 2.5+ years on a Sky Lake PC, with only the native tile-infested Start menu replaced with Stardock’s Start8. Honestly, no lockups, no BSODs, no sudden reboots, just stable as heck. Wouldn’t go back to 7, and absolutely not to 10 either. Windows 8 had two major very common complaints, the booting into tablet mode regardless, and no Start menu. Windows 8.1 fixed both of those, though the 8.1 Start menu was tile-infested a la the horrible Windows 10 one. Easily replaced with a Windows 7 style Start menu as mentioned above. Hanlon's Razor: Never attribute to malice that which can be adequately explained by stupidity. 9 users thanked author for this post. @karlston: I agree with most of that, except for the lock-up issue. I have been using Win 8.1 for 5 years and been happy with it, before that it was Vista, which I was also happy with, contrary to many others. But my Win 8.1 machine sometimes locks up, although I am never quite sure if it is an OS bug or an app that does – each time if happens (not often though) it’s a different app. got two Machines here that came with Win8.1 ready installed, I seriously have to dual boot with Win10 to put a bit of spice back in my computing life. Its disgustingly Boringly reliable, tediously does what and when its supposed to and is way to easy to update and defer updates without a problem, like where’s the challenge in that? 13 users thanked author for this post. Thanks, BobbyB, when you get to my age Boringly Reliable and Way Too Stable are exactly what you want. 6 users thanked author for this post. LOL, I do like my boring computing experience. I can concentrate on finding fun things that *I* want to challenge myself with. Windows 8.1 with KB2919355 installed is a LOT more usable than previous versions. In fact, I use it vanilla, no Start menu extensions or anything. I seem to be in a minority but I actually like it. I still have two of the cheap Windows 8 boxed copies that were released back in 2012 so I’m good from a licensing point of view. What about using Windows 10 Enterprise? It should be stable, since you can turn off telemetry and it only recieves security updates. One question is: how to get it for home (or small business) use legally? Why not just buy a product key for Windows 10 Enterprise? Well, Microsoft doesn’t even sell those to us mere mortals! While Microsoft offers paid upgrades to Windows 10 Professional, the Enterprise and Education editions of Windows 10 are only available through volume licensing channels. Microsoft previously offered Windows 7 Ultimate, which contained all the same features as the Enterprise versions of Windows, but there’s nothing like that for Windows 10. Chris mentions a way to trial Win10 Enterprise (i.e. for a VM), but this removes your Windows activation. Woody, I know this is off-topic for this thread, but injecting (just this once) since you made mention. Over time I’ve noted your occasional reference to Chromebooks as a preferred alternative to Windows and, by inference, other products. Is there or do you plan a Computerworld article addressing the pros and cons? I realize the Chromebook has been reviewed extensively but your point of view is always appreciated. Alternatively are there forums/sites you (or others here) would recommend to those of us who wish to move away from Windows? Would an “Alternatives to Windows” Lounge Forum be useful? The links are in the Forums tree on the right of the main page. Now imagine writing the same headline only few years ago…! It’s not hard to see why. 3rd party tools released after Windows 8’s debut to fix all the things Microsoft did wrong make all the difference. My Win 8.1 desktop sports a Start Menu, Aero Glass, re-theming to restore skeuomorphism, removal of all Metro/Modern Apps, UAC disabled, ability to run other OSs in virtual machines, a modern graphics card with up-to-date drivers… Essentially my system is not only up to but exceeding the professional level of capabilities of a well-tuned Windows 7. What’s not to like once all those basic issues have been resolved? Why is there such good 3rd party software to resolve them? Microsoft got Windows 8 very wrong out of the box and there are some very smart developers in the world who noticed. That’s a pretty big risk to take just because you feel mildly inconvenienced by the occasional elevation dialog. Uh, no, it’s not at all like inviting anyone in at any time. It’s more like being a professional carpenter and not having to constantly fight with the interlocks on a saw that claims to strive to protect you but really does no more than prevent you from getting your work done efficiently and effectively. It may sting to hear, but any sense of security you feel you’re getting by running software with reduced permissions is simply a false one. Many folks thought they were secure before Meltdown (or any other of a number of vulnerabilities) came along. You can actually place your security perimeter further out – protect the castle better as it were, so you don’t constantly have to fear the kitchen staff. That can actually be extraordinarily effective. I have worked a lifetime with my systems every day and have never managed to contract a digital infection. As a practical example, my systems don’t invite scripts in from most sites, and my systems won’t even try to visit sites that have been identified as hosting malware, tracking, ads, etc. The number of such sites is literally in the tens of thousands. So tell me: What’s better, running a malicious script that tries to break in, to be thwarted by privileges – or just not running it in the first place? Please feel free to continue to negotiate with your computer about whether you can do what you want; me, I’m getting work done. When working at the level I enjoy, UAC – considering file system and registry “virtualization”, not to mention changes in Explorer’s behavior – is more intrusive than just having to answer a few extra prompts. I have not seen very many people get major computer infections when they were using a computer normally and avoiding dodgy sites. The couple of cases I have seen were caused by unsupervised children being children. If you are not exposed you can catch the disease. I see that your version is called ‘Windows 8.1 Pro with Media Center’. Is that a special Media Center version? / Is Media Center not included in the regular version? Media Center was an add-on in Win8.1 obtainable through Microsoft. It was an extra cost upgrade to Pro. I wanted it to be able to play DVDs. Windows 8.1 with Media Center was released for those who still wanted Media Center and native DVD playback. It was a paid addon but was also released as a free upgrade for Windows 8 Pro users for a few months (until the end of 2012 IIRC). I still have a key for it that I got from the free promo. Don’t try to use that free key! I did and it destroyed my license. Seriously. The upgrade went in okay on my fully and properly licensed Win 8.1 Pro but then the system decided the activation was no longer valid. This was back in 2014 or 2015. I called Microsoft and some extraordinarily poorly trained folks in India decided I had to pay them $99 by credit card on the phone to get out from under the problem. I even allowed them to log into my system remotely and check things out, but no, they became convinced I was not properly licensed – even though I showed them a photo of my retail DVD/box and the eMail Microsoft had sent me with the free upgrade offer. I have always been a stickler for being properly licensed, and between my own purchases and my influence over corporate purchases, they probably built a wing (or at least an office) in Redmond on my dime. This incident was one of the stupidest, most dishonest things Microsoft ever did. I have not spent a dollar with Microsoft since that time and I have advised others not to do so if possible. ***** me? Then ***** you, Microsoft. I have been pushing all of my clients to Windows 10 build 1703 since shortly after it was released. Very very few problems have been encountered that could be pinpointed to Windows 10 itself. Early on there was an issue with the start menu not working (possibly an older build) and Intel display drivers on 32 bit machines. Pretty much everything else was Kaspersky or some other software that just needed to be updated. I feel entirely confident that Windows 10 builds 1703 and 1709 are ready for business, and I will be testing out 1803 very soon since 1703 is nearly end of life. I diligently use WSUS and group policy to tame the unwanted updates with great success. The only time that failed me was my own lack of understanding of what some of the new settings meant, such as update deferral policies. Woody set me straight on that and no problems since. Which version of WSUS are you using? I’ve loved 8 since I put the Dev Preview on my first touchscreen laptop back in late 2011. If you have a touch-based system they improved so much over standard 7. 8 overall was always more stable than 7 (for me at least), faster boot, better support of newer technology (GPT, TRIM for SSDs) and Pro included some huge feature increases (Hyper-V being my most used). Plus Pro only cost $50 at launch. It really is too bad that they didn’t make the UI be switchable to classic mode by default. The upgrade between Win8 and 10 is… limited to a dynamic launch screen, a worthless “Windows” button, and a slightly improved UI. And that’s before all the negatives. As an aside, I find it funny that saying “use 8.1” would be the same as saying “I prefer Vista” or “ME is better than XP” back in the old days. That just shows how far we’ve fallen. That just shows how far we’ve fallen. Apologies for being somewhat off-topic, but I’m not sure that this requires a whole other post to itself. I currently have a Windows 7 main computer, and will be having to look at a replacement in the forthcoming year or so. I tend to use computers for quite a long time, so support ending for Windows 8/8.1 in 2023 (~4 years, assuming I get it in 2019) is a bit of a turnoff. In the case that I do end up turning to Windows 10, I’ve been considering Pro… but looking at all the features is a bit dizzying. Is it all right to get Pro solely to use the update deferral system, and more or less ignore everything else, or will I need to futz around with all these other features as well? You aren’t forced to use any of the advanced features in Pro if you don’t want to. Off the top of my head, I can’t think of anything that’ll be different in a base install between Home and Pro, as in anything special you might have to turn back on or off. Pro has no features cut either compared to home, that I’m aware of. Thanks for the response! Another question: if I never use the other features, I would still need to be concerned about security updates/breaches to them, correct? Or am I relatively safe so long as those features are disabled and I install the cumulative updates (at my own pace, of course)? It depends on the feature. Mostly, no. There’s some I could see as increasing your attack surface (eg, Group Policy), but they’ll be patched with the usual monthly updates. It also helps that I’ve never heard of a Group Policy exploit. Any that do occur should still prompt for credentials to be let in. I hadn’t used Windows for a while, so in 2013 when I got my tax refund, I was ready for a laptop. Windows 8 had just come out in October 2012, so in February 2013 I went to Best Buy, bought the ASUS laptop I’m writing this on, & got Office 2013 Home & Student as an add-on. The Win8 interface was interesting… but the 2nd thing I did after buying the PC & Office was buy “Windows 8 All-In-One for Dummies”. That’s when I started sitting at the foot of the Wise One, Woody Leonhard! His book helped me navigate through the Windows 8 morass. When Windows 8 Update (AKA Win8.1) was ready, I jumped on that. Microsoft actually made Win8 slightly easier to use… & Customizable. Whoda thunkit?! Yes, if you can either upgrade a Win7 machine or Downgrade Win10 to Win8.1, do it. You’ll have just over 4 more years of Extended Support if you do it ASAP. Once Win7 support ends in 2020, be careful, however… because Win8.1 will probably be next in Microsoft’s cross-hairs to make mischief on! Windows 8.1, 64-bit, now in Group B! As a Windows 8.1 user, I can definitely vouch. It is a very stable OS. Still feels a lot like 7 with some of the benefits which Windows 10 would have like Secure Boot and better SSD support. I use a start menu replacement called “Open Shell” which is an open-source successor to Classic Shell. With that, Windows 8.1 becomes a much more stable, faster, and slightly less pretty Windows 7. Yeah 8.1 was OK, the Jekyll and Hyde stuff from 8.0 was muted a bit and using classic shell pretty much got you back to a modern Win 7. For me the option beyond Windows will be a Linux desktop. Why bother with Chrome OS? Its just another mega corporation and worse it is built on ad revenue. Nah, I think Linux offers a who lot of potential if it became more popular. I’m going to be the heretic. Windows 10 Pro 1803 is running very well here. Please don’t flame me, but it’s true. Am I lucky? Maybe, but I’m running some pretty heavy programs (Steinberg Cubase, Wavelab, NI Kontakt) without an issue. I’m not going to blame anyone who wants to stay with 8.1, Linux, IOS – if it enables you to produce, go for it. Ah glad you’re happy with W10. So a musician using W10, do you use solely software or/ and connected midi hardware also? How are the latencies in W10 using connected hardware? Windows 8.1 download direct from Microsoft. You’ll need a product key. This might be a direction I move in, all our workstations came with Windows 8 licenses but with the “downgrade” rights exercised to Windows 7. I am curious about one thing though, I cannot imagine how you would migrate an enterprise from running a Windows domain to Chromebooks. I am not saying it cannot be done because I genuinely don’t know, but that would be one of the larger sticking points for me. Many Enterprise applications run in the browser now so as long as they don’t need IE, or they’ll work with the IE emulator extensions, changing to Chrome wouldn’t be too bad. For many common products like the Office suite you may be able to get away by running Google Docs or something like OnlyOffice. There’s also self-hosted webmail systems that can replace Outlook (there’s some I’ve been looking at but don’t have links atm). For applications that need to run on-system, there’s always RDS. Kind of kicks the can down the road, but if you can get most of your software off Windows, paying for a couple dozen licenses isn’t too bad. I’m looking into something similar at the moment, although we’d likely be going Linux not ChromeOS. We’re already VDI over zero clients, so changing out Windows just requires a working image. I use Remmina to connect from my Linux PC to my Windows 7 backup server, which is tucked in a corner of the room under an end table, mostly headless (it has a spare monitor attached, but no mouse or keyboard, and you can’t use it just with the monitor… it’s not a touchscreen). Works beautifully! There’s an official Chrome extension “Chrome Remote Desktop” that allows you to connect into RDP without secondary software. Used it on a test Chromium system I was playing with a while back. For a full Linux, I’ve heard good things about FreeRDP, which is my current plan to migrate to using on my home systems. The FreeRDP site also had links on how to set up an RDP server on other linux systems if I recall correctly, so it may be possible to keep to a single protocol for all devices. I get that more and more applications are “moving to the cloud” but none of that addresses how you centrally manage the structure of getting there. How do you deal with machine management? User logins and passwords? So on. I cannot imagine trying to run a large organization without Active Directory and Group Policy. For whatever flaws Microsoft and Windows have, they got this part right as far as I can see. Plus, I can’t say I trust Google any more than I trust Microsoft. Let me preface by saying: I don’t endorse running everything in the cloud. Cloud systems are nice for being “simple” as it removes most of the administration headaches from the system itself. However in doing this, it also removes much of your ability to control or diagnose issues. The best analogy I can think of is: Managing your own network is like owning a grill. You cook what you want when you want it but it takes a long time and sometimes the end results aren’t very good. When you go cloud, you’re going to McDonald’s. You can run a maintain a domain across the cloud via systems such as Active Directory Federated Services, LDAP multi-tenant setups, Single Sign-On system (like SAML), or even SaaS systems like Jumpcloud. If you’re going a hosted route (eg, AWS) then you can manage a standard domain controller in a private VLAN. Single Sign-On systems are quite commonly used to share only some of the domain information with a cloud provider, while systems like ADFS exist to basically “extend” a domain into other networks. Me. Have way too many apps that don’t run on Chromebooks. If you get on pro, push off feature updates, don’t install security updates for at least a week you’ll be fine. The bugs that Microsoft are fixing are typically Enterprise stuff that … yes… should have been patched ages ago but doesn’t impact mainstream users. WOW! Me too, abbodi86… the only UWP apps I use are Mail, Calendar, Weather, News, Sports, Money, Office, game apps, & a few more. Facebook & Twitter had UWP apps, but MS never upgraded them to act like the updated websites. Those went to Win10… so I uninstalled the UWP apps & access the websites via Firefox. I completely de-apped my Windows 8.1 installations. When I tab over to the Apps tab in Task Manager, it just says something like “No data available.” It’s not MS-approved, of course, but none of the apps have ever come back, and I’ve never missed any of them. Stepping back, many (though not all) posts here say in effect that Win 8.1 is nearly as good as Win7, mainly due to Classic Shell (which is now defunct and replaced by an open-source project). I first embraced Classic Shell when I shifted from XP to Win7. Like some others who haven’t forgotten and speak up now and then, I didn’t think the Win7 user interface improved on XP. There was a big improvement in reliability and security (as promised), and that was enough reason to upgrade. But the user interface was not the reason. So, considering Win8.1 and its interface (as modified by Classic Shell or whatever), the proposition is that it’s almost as good as Win7, which was almost as good as XP. The whole trend has been a case of swimming against the tide of Microsoft’s attempts to de-emphasize desktop computing. The other proposition is that you get another three years of support. I don’t lightly dismiss the value of that, but in view of what’s happened with updates since the end of 2017, it’s questionable, as is the idea that Microsoft will honor its pledge to support. I can get official versions of 8.1 Pro Retail for about €35 and an OEM version for about €25 here. How easy is it to upgrade from a Group B Windows 7 Pro x64 to a fully updated and functional Group B Windows 8.1 Pro system? First off, I’m extremely skeptical that those versions of Win8.1 are legal. Going from Win7 to Win8.1 would be a clean install. + Ahead of time you would need to document your hardware b/c you may need to find drivers. Win7 drivers will not necessarily work on Win8.1. + Also, you should run the Win8.1 compatibility tool (from MS) b/c some older Win7 programs may not work on Win8.1. You may need late versions. + Very important – I would make an image of the Win7 machine (in case you have to go back) and a separate backup of your data (in case you are successful). + As far as the install is concerned, somewhere on this site I have gone into detail on a Win7 clean install for Group B. The methodology would be the same. Install the OS from your media offline, and there are several patches that should be installed offline before the general update begins. Update through October 2016 (the telemetry didn’t start until Nov 2016 and there are some important patches in the Oct 2016 Rollup). Then update from AKB2000003 up through Dec 2017 (Jan 2018 is when the Meltdown/Spectre stuff started). Updating from Jan 2018 to current is a minefield. There were patches that had to be installed before other patches. You will have to wade through each month’s DEFCON threads and ConputerWorld articles. The Group B updates in AKB2000003 are current. + After you are up and running and activated, install your programs and restore your data. It’s a JOB!!! Give yourself a week to line it out if you have any other kind of life. Thanks, PK. I checked my manufacturer’s downloads and they have all 8.1 drivers etc., but apart from that: doesn’t look easy. About the legality of those versions: here in Holland there are a couple of legit online shops/services that sell software & licenses and have a solid reputation among professionals. We purchased Office 365 in such a way. Very cheap, legit and good support. @leaningtowardslinux just to add to @pkcano ‘s excellent advice your looking at approx. 2-2.1GB updates on a clean install of Win8.1 in addition to the current REV3.0 images being distributed by M$, the good news is the REV3.0 images have all the really huge updates incorporated in them such as KB3000850 but the bad news is that they also have, off the top of my head and my little scratch list here KB2976978 already incorporated which is a Telemetry snoop update, it will be offered again during updating on install and can be cheerfully ignored if you wish. The KB2976978 is pretty much impossible to remove even with DISM (offline) alas but you can find it here: https://www.microsoft.com/en-us/software-download/windows8ISO just need a legit key or ready installed compatible BIOS key for Win8.1 and your good to go. I may have to go that route. I primarily stay with Windows (7) because I do a bit of gaming, and FFXIV only runs nicely on Windows, so I’ll spend the next year getting myself up to speed on Windows 8.1’s interface (I already dual-boot my OS) and leave the switch-over to the last minute. I wonder if we’ll see an uptick in 8.1 usage as the deadline on 7 looms. Would be hilarious. Is anyone else having problems with Windows 7 Microsoft Update??? All of my computers are erroring out (8024402C) trying to contact the MS update servers. I agree, Windows 8.1 in its current state is an excellent choice once it is paired with a start menu replacement like Classic Shell. I have been running Windows 7 and Windows 8.1 on my Windows systems (X99) for some time. I started using Classic Shell under Windows Vista and Windows 7, as I don’t like Windows 7’s default start menu and preferred the Classic start menu in Windows XP, and so I also configured Classic Shell to use the Classic menu in Windows 8.1. Another essential (for me) little program called ShellFolderFix, which kept the size of folder windows and which was originally developed for Windows 7, also works fine under Windows 8.1. So I can see myself running Windows 8.1 (even on “unsupported” systems such as Ryzen) for the next few years. The most important thing is, like Windows 7, you can choose when to install patches on Windows 8.1, even the Home version, unlike the rubbish Windows 10. However, even after the end of support of Windows 7 in January 2020, I will still keep a Windows 7 partition on each of my systems and continue to run it when I need to. The end of support of Windows 7 is NOT its “demise”, at least for me, as I can continue to run it until the underlying hardware fails. I don’t need Microsoft’s “support” other than its security updates, and those updates can be more trouble than they are worth, as 2018 shows. I have already decided there is no point for me to patch my systems every month unless there is an urgent security issue like Wannacry, and instead I will patch when I want to, perhaps once every 4-6 months. I will avoid Windows 10 for as long as I can. Wow. What a boxcar load of responses! Nope. I need something custom built to handle heavy graphics, (which I have in mothballs at the moment, due to travelling requirements…using a laptop, built like a battleship for that), and uses nearly every erg of it’s 500 watt Power Supply and five cooling fans. I am Win7 user and will obviously have to migrate to another platform as the end of support gets closer. Understandably, it is being suggested that we move to ChromeOS, but why not also discuss an alternative such as macOS? Some of us do prefer greater levels of privacy and appreciate the option to use other browsers than Chrome. Does anyone have an opinion on the matter? And add your views or questions to what you find in those topics. If you have a favorite that does not appear yet, feel free to start a new topic. There is a space for that below the listing. Sure, I would tell you and probably PKCano would agree, if you can afford a Mac, get a Mac. They are very reliable and they run Office if you need it (or the closest Office version to real Windows Office). They probably offer the most polished experience after a stable tweaked Windows version. I run many tweaked Windows 10 offline and they are fine because they don’t change. Windows 8.1 is better in some aspects, Windows 10 is better with others. For me, Chromebooks are a big no for privacy reasons and I prefer to manage everything on my computer with no online storage. I don’t mean they are a bad choice at all, just not the right choice for everyone. When it comes to OS, the first thing to consider is what you need to run because it can be a deal breaker. At some point, I am sure I will have to keep Office in a VM for some computers where my only use of Office is for personal documents with macro code. I am planning to migrate some users to Linux (we already have started), but lots of them will continue on Windows for lack of acceptable alternative. As for 8.1, I think it is great. I have many users on it and their computer is rock solid. The greatest thing about it is although it can be a bit of a pain to go through the messy settings if you are the kind of person who looks at everything, once they are set to your liking, they won’t change. You will have the same Windows 8.1 you like for as long as it is supported. This is worth a lot. And tweaked Windows 8.1 is really great overall. It has a few nice things that 7 doesn’t have. The worst problem with Windows 10 to me is it changes constantly, which means I have to always review everything new or changed to adjust it to what I find secure and more private (which is often not what Microsoft does when they introduce novelty). It is deeply annoying. To me, Windows 8.1 tweaked is quite pure and lean. It is fast and out of my way. It has much less running processes than Windows 10. I think Classic Shell is necessary as I find the full screen start menu extremely distracting. Using the Windows key all the time to search (I never go to start menu to browse), I hate seeing my desktop disappear while I search for something. What stops you from running only the “reference” versions like 1607, soon (or even now) 1809 and so on, one version every about 2 years? A lot of corporations do that and they do not run LTSC(B), most run full Enterprise, but Pro would behave in the same way for this purpose. I am convinced that you know how to block updates and upgrades if you wish so (on Pro and above obviously). I don’t like running unpatched for extended periods of time. I think having a zero day that would be significant could cause me issues. Worm type vulnerabilities can be quite scary and if an easily exploitable side-channel would be discovered, I wouldn’t like it. Maybe I could then let computers upgrade at the time and sure, it doesn’t happen often, but I am very conservative when it comes to security. I prefer not to spend too much time researching the level of risk I run for each unpatched vulnerability. I patch, lock tight and sleep at night. I patched for Meltdown and Spectre sooner than many. Maybe it wasn’t warranted, maybe we just don’t know anything about who is able to exploit it silently for targeted industrial spying, due to the very nature of these vulnerabilities. So, my first reflex is not to run an unpatched version, but yes, you raise a good question in the light of the current context and it is not impossible I might reconsider my position in the future, depending on where Microsoft wants me to go. Win8.1 is my plan to hope for 10 to be re-invented no-spy or for some important changes with linux. Now that Red Hat is under IBM there is a little chance some extra support will come. My biggest and pretty much only nearly unfix-able problem with 8.1 is that the graphic cards manufacturers all drank the cool-aid from MS and do not produce any new drivers for 8.1. Is that so already? If true, that would mean my fear with 8.1 that everyone will just stop supporting it when 7 is done might come true. I don’t revert from 10 to 8.1 for this reason. In the past, Adobe dropped support for Vista even before XP was not supported anymore for “too small of a market”. When the only non Universal apps OS supported will have a very marginal market share, I’m not sure that Microsoft won’t start to push full speed for all kind of things they can’t do right now without alienating the 7 crowd. Ignore Windows 8.1 for one moment and think Windows 2012 R2. You have your answer then. Nvidia’s last 10 series cards drivers are less than a month old. I see that there are no 8.1 drivers for RTX series, but there are for Win7, so maybe they’ll do 8.1 ones in the future. AMD, as I can see, have abandoned W8.1. The solution is to buy 1080 Ti. Will last for some time still :). If there are drivers for Win 10, they should work on Win 8.1, which is a very close relative. Win 7 is already ancient technology considering the current standards, but it works for those who don’t demand much from their OS. While I agree with the general concensus here that W8.1 is a better medium term option than W10, based on my experience (a small sample admittedly) I disgree with Woody’s assertion that “Windows 8.1 remains the most stable version of Windows — even more stable, of late, than Win7”. Since I started dual-booting W8.1 alongside W7 (as default) on both a 32 bit and 64 bit PC about 18 months ago (with the intention of switching defaults at some point) I have had no problems following W7 only Group B style security only and IE updates (thanks in part to this site), but a few after similar W8.1 Group B updates (and one common to both W7 and W8.1). So although I may change to W8.1 some time further down the track, I believe that W7 is still the better option for now. BTW: I do use Classic Shell in W8.1. In fact I also use it in W7 to replace the clunky W7 start menu with the classic start menu from earlier Windows. I have to agree that Windows 8.1 is stable. Running it on Kaby Lake with a patch to renable updates and it works beautifully. There’s one audio related that’s out of my control and that’s only because the drivers weren’t 100% intended for 8.1, but I just run Winamp in the background while I work so it prevents it from ever happening. Chromebook probably won’t be my option. I’m considering the Linux route right now. Originally I was waiting to see if my AV/Firewall vendor would port everything to Linux, they’ve ported just the AV part. There’s a Firewall project now being shipped with Debian based distros that does the same thing as my Vendor’s Firewall, so I might just downgrade to the standalone AV product and save $25 a year without the combo. Shame because the combo has a bunch of nice features not otherwise offered. For Business, were considering Linux. We are going to ditch office for Libre Office now that it’s stable. They even have a ribbon like interface now that’s 100% optional. The only thing were not certain of is whether our accounting software will work. I run Linux Mint 64-bit as my primary OS. My computer has 12 GB of RAM. 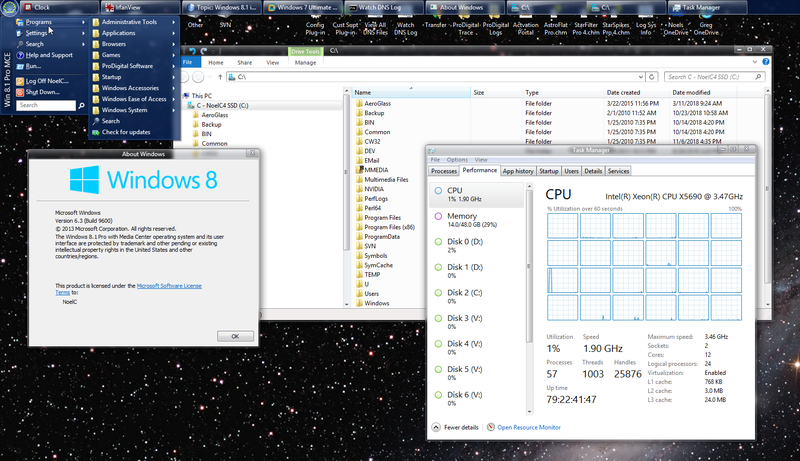 My Windows 8.1 VM runs extremely well. I run it full-screen, and you would never know that I was running Windows as a VM — it runs like it was the host OS on the computer. 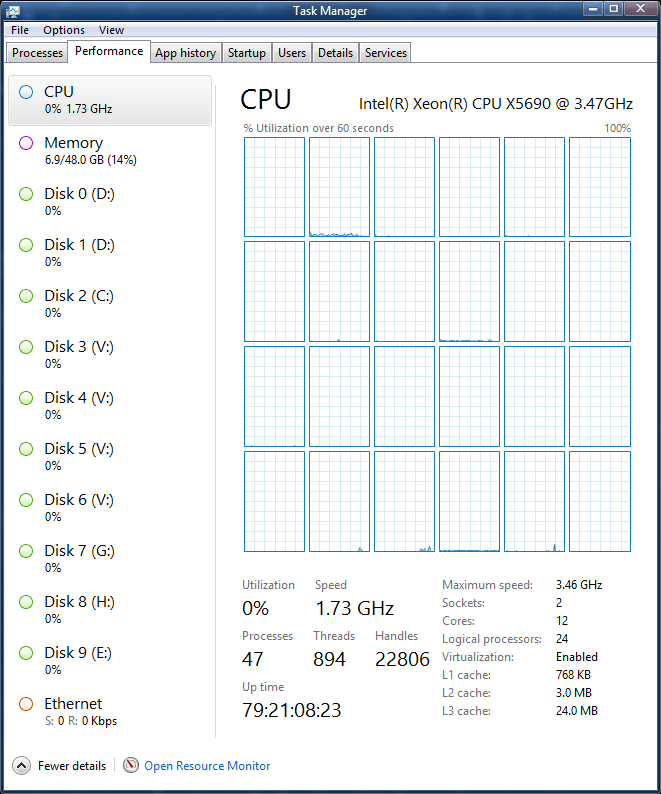 If you have at least 8 GB of RAM installed in the computer, then you can safely allocate 4 GB of RAM to the Windows 8.1 VM; and Windows 8.1 will then run so well you will think it is the host OS. Meanwhile, I am doing more and more in Linux, and less and less in Windows. Since I can freely switch between the two environments with no loss of performance, I can pull that off with no problem. In my opinion, this is the best way to run Windows these days. What would be the best course of action for someone who uses their PC for mainly gaming (using Steam and Battlenet clients) and Illustrating in Photoshop? I’m not sure if a Chromebook would be powerful enough (or compatible?) for what I mostly use my Win 7 PC for. I know Win 10 is very picky when it comes to drawing tablets and is an overall headache for artists struggling with the drivers… I just don’t know if Windows 8.1 would hold out long enough for me to stay on that for a long time? ChromeOS won’t do what you want if you want to game. Linux is more likely however it’s not perfect. In the past, driver support was terrible from graphics cards makers but in recent years it’s improved. NVidia I think has the best mainstream drivers thanks to using binaries. AMD does work but requires some fiddling, however they work much more closely with the community. Steam has full support on Linux. Their games don’t always. They are starting to offer more games to run with little configuration on Linux, and they have their own OS: SteamOS. Linux is probably the best solution outside of Windows, although Mac is starting to see some love as well. As for tablets, you may be SOL depending on what brand you use. Wacom has a Linux Wacom project which, while not official, will offer better support than most brands. Off-brands will be hit or miss. Some of the bigger ones like Huion may not offer Linux support (they have Mac or Win) may be supported by their community. Its been years and Windows 8.1 is always the one I recommend to my friends, gone is Windows 7 as it’s not optimized for MadVR/HTPC usage. If there’s only a way for me to use that to my z370 system I will do so, but it seems drivers are a pain to find if I do so. We had a small home network of business/personal use Windows machines set up with Windows 8.1 along with the Start8 interface. We hardly would have chosen to make the switch to Windows 10 several years ago if we had known that Microsoft was going to force us to spend substantial and tedious time every month babysitting security updating — unlocking WU service, dealing with unwanted or faulty update packages (hiding), relocking the WU service, cleaning out unwanted MS scheduled update tasks, and so on. Plus dealing with all the other shoddy service issues MS randomly throws out otherwise to the WAAS environment — our machines just now are showing the false authentication issue errors, the latest MS [mess]. I’ve been thinking for some time now that I may upgrade to 8.1 instead of 10 when support runs out for Windows 7. Regardless, it’s going to be an enormous headache, and I do not thank Microsoft for making the decision such a difficult one with all their bloatware, forced broken patches and such. @anonymous: remember: from Win 7 to Win 8.1 is an upgrade, from Win 7 to Win 10 is a downgrade. I would look into purchasing whatever Windows 8.1 licenses you need now, rather than waiting until Windows 7 goes out of support. At some point, you won’t be able to buy Windows 8.1 licenses anymore.